Of about 70 species of citrus only two, the grapefruit (Citrus paradisi Macf.) and the sweet orange (C. sinensis Pers. ), are industrially processed on a large scale, mainly for juice or sections. The by-products are peel, rag (the stringy axis and white fibrous membrane) and—depending on the method of processing—citrus molasses and citrus seed meal. Another citrus fruit, the lime (C. aurantifolia [Cristm.] Swingle), is of importance in some countries where it is processed to yield lime oil and lime juice. The method of processing this fruit is different from that for grapefruit and sweet oranges and is dealt with separately. In many countries the citrus industry supplies feed for animals from the large quantities of by-products. The harvest usually coincides with the dry season when grass is scarce. This article is an attempt to bring together available information on ways of utilizing the surpluses and industrial by-products. * Formerly Associate Expert in Animal Nutrition, FAO, Rome, Italy; at present at the Department of Animal Nutrition, College of Agriculture, Uppsala, Sweden. The grass in citrus orchards is usually not grazed as mature cattle could reach the fruits on the trees. Fallen grapefruit and oranges, as well as lemons, are eagerly eaten and these, together with surplus and unmarketable fruits, can be used for feeding cattle. Intakes of up to 40 kg per day have been reported with no apparent harmful effects (Volcani, 1956) apart from the danger that the whole fruit may obstruct the oesophagus. The fruits should therefore preferably be cut before feeding. This can most easily be done by passing the fruits across a frame on which parallel sharp knives or saw-blades are mounted a few centimetres apart. There are conflicting views as to whether or not fresh citrus fruits will affect the taste of milk. It seems that grapefruit in particular should be offered to dairy cows only soon after milking in order to avoid flavoured milk. Citrus fruits have sometimes a beneficial effect on milk yield and may also temporarily raise the butterfat content (Volcani, 1956). Attention should be given to protein and mineral supplements when feeding fresh citrus products because they provide little protein, calcium or phosphorus. Pigs prefer oranges and tangerines to grapefruit and the free choice feeding of citrus fruits, together with a protein supplement, has given good results with these animals (Gohl, 1970). When oranges or grapefruit are processed for juice or sections, 45 to 60 percent of their weight remains in the form of peel, rag and seeds (U.S. Department of Agriculture, 1962). This waste is palatable to cattle and mature cows will, when they are accustomed to the feed, consume about 10 kg per day. Because of the high water content and the perishable nature of the waste, economically it can only be used close to the processing plant. The feed is rather difficult to handle, will ferment and sour quickly, and can be a fly-breeding nuisance if allowed to spoil. The large amounts which are available during the harvesting season can be ensiled for year-round feeding, but as citrus pulp is rather moist the silage loses up to 40 or 50 percent of its fresh weight during fermentation (Volcani, 1956). It is more advantageous to mix the fresh pulp with partially dried grass or with legumes which cannot be successfully ensiled on their own. The liquid lost from the pulp will then be absorbed by the green fodder. The silage has a pleasant odour and is readily eaten by cattle. Citrus pulp silage has a much higher weight per volume than that of grass or maize silage and therefore silos in which it is to be placed should be more strongly reinforced. This problem does not apply to trench silos. Citrus pulp can be easily ammoniated. The simplest method is to load the waste into a long polyethylene sleeve and let ammonia gas from a “bomb” (ammonia under compression in a steel cylinder) into one end. The progress of the ammonia is easily followed as it turns the pulp brown and heats it. When the ammonia reaches the other (open) end of the sleeve the gas is turned off and the excess ammonia is aired off from the pulp before it is fed to cattle. The added nitrogen is insoluble in water and is stably bound to the organic matter, apparently combining with the pectin. The crude protein digestibility of ammoniated citrus pulp is about 60 percent (Volcani and Roderig, 1953). The excess moisture is removed in a press before drying the pulp. The press liquor may be discarded, or concentrated under reduced pressure to 60 or 70 percent dry matter and used as animal feed (citrus molasses). The entire wet material is dried directly in a rotary drier. This method is practical in areas with access to natural gas or other low-cost fuels. Dried citrus pulp that has been pressed before drying is somewhat lower in nitrogen-free extract. Only the contents of ash, fibre and water are consistent, while protein, fat and nitrogen-free extract vary according to season, the proportions of oranges and grapefruit used, and also the quantity of seeds in the fruits. Citrus pulp is the most versatile of the citrus feeds; it is palatable, rich in nutrients, easily mixed with other feed ingredients and exerts a mildly laxative effect. It can be stored for all-year feeding and deteriorates less in storage than many other feeds. Rodents and birds are not particularly attracted to it. Dried citrus pulp is slightly hygroscopic and should therefore be stored in as dry a place as possible. The major disadvantages of this feed — bulkiness, its varied particle size and its characteristic of “bridging over” discharge outlets of storage bins — can be overcome by pelleting. The process used at present for pressing feeds into pellets requires a high consumption of power and has a low plant capacity, factors which tend to make pellets more expensive than other forms of feed. Only citrus pulp intended for the rapidly growing export market is now pelleted. A new method that takes advantage of the fact that wet citrus pulp approaches a semiplastic state under pressure has been developed (Shoemyen, 1969): the pulp (not treated with lime) is mixed with molasses and extruded under low pressure in a continous process. No difference is made between dried pulp from oranges and grapefruit. Because of the method of processing it is a good source of calcium, but it contains little phosphorus. Due to this imbalance it is necessary to ensure that calcium and phosphorus levels are adequate and are of the right ratio when dried citrus pulp is included in the diet. Figure 1. 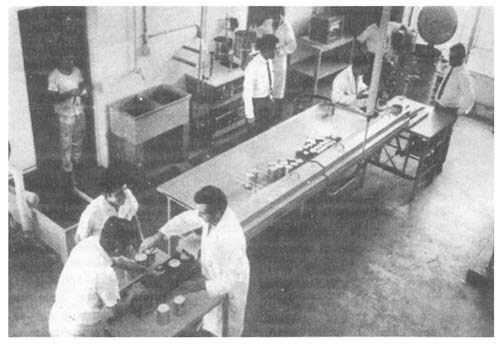 Processing and canning of tropical fruit in Peru. In some case cattle grazing on phosphorus-deficient land and being fed the pulp in large amounts have become ill because of an improper calcium to phosphorus ratio. As citrus pulp has a low vitamin A content, green leafy roughage should be an important ingredient in rations with high levels of the pulp. Figure 2. Adding citrus molasses to maize silage in Kenya. Dried citrus pulp has been used as the main energy source for beef cattle and heifers, and up to 45 percent has been used in calf rations. However, the pulp should not be used at high levels for milking cows as milk production tends to decrease. Digestibility trials with sheep show that its digestibility decreases when citrus pulp is included at levels in excess of 30 percent of the ration (Devendra, 1971). In a review of 73 experiments (Kirk and Koger, 1970) no significant differences in gain or energy conversion between steers fed rations of maize or of dried citrus pulp were found when each was combined with adequate protein and other essential nutrients. A positive correlation (r = 0.46) was found between percent of energy from dried citrus pulp and dressed carcass percentage. In other experiments (Boucque et al., 1969) with high-energy diets given to young bulls, where dried citrus pulp replaced dried sugar-beet pulp on a weight-for-weight basis, no significant differences were found with respect to dry matter intake, feed conversion, daily gain or carcass quality. Substances toxic to swine and poultry are present in dried citrus pulp that includes seeds, and the high content of fibre also restricts its use in pig and poultry rations. 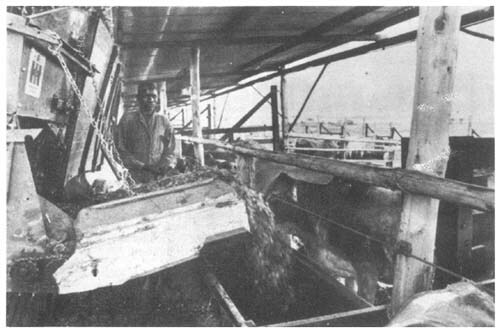 However, dried citrus pulp has been used as poultry deep litter which has subsequently been used with good results as livestock feed (Harms et al., 1968). The liquid obtained from pressing citrus waste with 9 to 15 percent soluble solids, of which 60 to 75 percent are sugars (Hendrickson and Kesterton, 1964), can be concentrated to become citrus molasses. Without this further processing the liquor has a high biological oxygen demand and can create a waste problem if dumped into lakes or streams. It may indeed amount to more than half of the total weight of the waste. Citrus molasses is normally a thick viscous liquid which is dark brown to almost black in colour and has a very bitter taste. This taste does not affect its usefulness in cattle feeding, however, and in fact it can be used in the same way as, sugarcane molasses. It may be mixed with pressed pulp prior to drying and thus the energy content is increased in the dried product without destroying the keeping quality of the pulp. When fed free choice to cattle up to 3 kg per day are consumed. It is not so readily accepted by pigs. Citrus seeds are sometimes collected separately at the canning plants and subjected to an oil extraction process. The resulting oil cake is usually called citrus seed meal and compares favourably with many sources of vegetable protein. However, it contains limonin, a factor toxic to pigs and especially to poultry. Citrus seed meal is therefore unsuitable for these animals because at 5 percent inclusion it will reduce growth and at 20 percent it will cause mortality in growing chickens (Driggers et al., 1951). It is acceptable to ruminants and comparable to cottonseed oil cake with the same percentage of crude protein. There is thus no restriction on its inclusion in diets for ruminants. The lime fruit resembles a small orange with a thin skin, either green or yellow in colour. It is cultivated because of its aromatic taste and is processed into lime oil and lime juice. After the lime fruits have been crushed and the juice and the oil have been squeezed out, the skins are discarded. Lime processing plants are usually too small to justify a drying plant. The skins are a good feed either fresh, sun-dried or ensiled. The seeds are usually collected separately in the plant. They are rich in fat and protein and should be mixed with the skins and given only to cattle. Due to the presence of toxic factors in the seeds, they should not be fed to poultry and only with care to pigs. Such feeds tend to produce soft fat in pigs. Ruminants can, however, tolerate them. If lime skins are fed in large quantities to dairy cows the morning milk may have a weak off-flavour and be opalescent. Farmers using the feed claim that lime skins rid cattle of ticks and give their coats a glossy sheen. By-products from the citrus industry can make an important addition to the amount of locally produced feed for animals. In countries where the quantity of peel and rag from canning industries is large, drying is in most cases the preferred way of conservation because dried citrus pulp is easy to handle, to transport and to mix into compound feeds. Close to 700 000 tons of such dried citrus pulp are produced yearly in the United States. The cost of drying can be estimated at about US$40 per ton of the dry meal (10 percent moisture). Other countries producing dried citrus pulp for local use as feed include Trinidad with a yearly production of 4 000 tons and Jamaica where two plants produce a total of 4 500 tons per year. Bondi, A. & Meyer, H. 1942. The digestibility of citrus feeds. Emp. J. exp. Agric., 10: 93–95. Boucque, Ch. V., Cottyn, B.G. & Buysse, F.X. 1969. Production intensive de viande bovine à base de pellets de pulpes séchées d'agrumes et de pellets de pulpes séchées de betteraves sucrières. Revue Agric., 11–12: 1553–1570. Devendra, C. 1971. M.A.R.D.I., Malaysia. Personal communication. Devendra, C. & Gohl. B.I. 1970. The chemical composition of Caribbean feedingstuffs. Trop. Agric. Trin., 4: 335–342. Driggers, J. Clyde, Davis, George K. & Mehrhof, N.R. 1951. Toxic factor in citrus seed meal. Gainesville, Florida Agricultural Experiment Station. Bulletin 476. 36 p.
Gohl, B.I. 1970. Animal feed from local products and by-products in the British Caribbean. Rome, FAO. AGA/Misc 70/25. 97 p.
Harms, R.H., Simpson, C.F., Waldroup, P.W. & Ammerman, C.B. 1968. Citrus pulp for poultry litter and its subsequent feeding value for ruminants. Gainesville, Florida Agricultural Experiment Station. Technical Bulletin 724. 12 p.
Hendrickson, R. & Kesterton, James W. 1964. Citrus molasses. Gainesville, Florida Agricultural Experiment Station. Technical Bulletin 677. 27 p.
Kirk, W.G. & Koger, Marvin. 1970. Citrus products in cattle finishing rations. A review of research at Range Cattle Station 1946–1960. Gainesville, Florida Agricultural Experiment Station. Bulletin 739. 34 p.
Neumark, H. 1971. Volcani Institute of Agricultural Research, Israel. Personal communication. Shoemyen, J. 1969. Citrus pulp pellets formed by extrusion process. Gainesville, Florida Agricultural Experiment Station. Sunshine State Agr. Res. Rep., 1: 5–6. U.S. Department of Agriculture. 1962. Chemistry and technology of citrus, citrus products, and by-products. Washington, D.C. Agriculture Handbook No. 98. 99 p.
Volcani, R. 1956. A survey of the use of citrus fruit and waste for feeding dairy cattle in Israel. Ktavim, 6: 135–147. Volcani, R. & Roderig, Ch. 1953. The enrichment of citrus peel silage with nitrogen by application of ammonia and ammonium sulphate. Ktavim, 1: 21–22.